Also referred to as chronic shoulder pain or shoulder blade pain or shoulder joint pain, shoulder pain may emanate from the actual shoulder joint or it can arise from any of the myriad muscles, tendons and ligaments that surround the shoulders. Shoulder pain which emanates from the shoulder joint normally worsens with activity or when the patient moves the arm and the shoulder. Several ailments and conditions which impact on structures in the chest or abdomen, like gallbladder maladies and heart conditions, can also result to shoulder pain. If said pain emanates from a different structure, it’s termed as referred shoulder pain. Typically, referred shoulder pain does not worsen with exertion or shoulder movement. 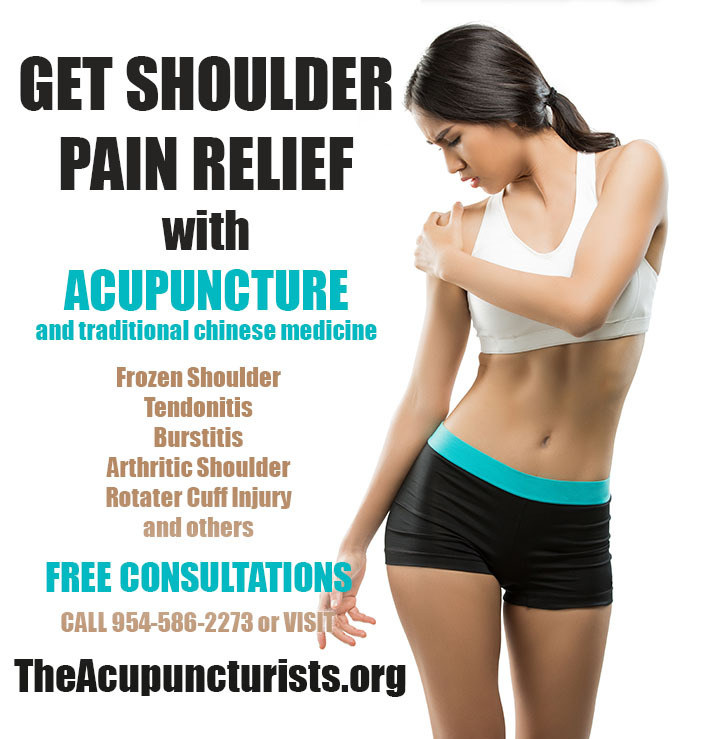 Regardless of the type of shoulder pain you may be suffering with, Acupuncture and TCM, Traditional Chinese Medicine, can alleviate the pain and address the root cause of the pain, giving you lasting results. We’ve had much success treating patients in the Coral Springs, Margate, Coconut Creek area and we are confident that we can help you too. Before we discuss more on our brand of holistic medicine, let’s take a look at some of the common symptoms, causes and conventional treatments for shoulder pain. Symptoms of shoulder pain are different for the different types of shoulder problems. Some common shoulder ailments include dislocation, arthritis, separation, fracture, frozen shoulder as well as rotator cuff disease. Dislocation – Shoulder dislocation happens when the ball of the shoulder joint gets out of the socket. This may occur when the arm is pulled strongly or if someone twists his/her shoulder. Arthritis – Forms of arthritis that affect the shoulder exist in two forms: rheumatoid arthritis which leads to inflammation of the shoulder joint and osteoarthritis which results from the wearing and tearing of the cartilage. Separation – Shoulder separation results from torn ligaments that join the shoulder blade to the collarbone. Such injuries are usually caused by falling over an outstretched hand. Fracture – A shoulder fracture refers to a crack on the upper arm bone or the collarbone. Fractures usually result from falls or heavy blows to the shoulder. Frozen shoulder- A frozen shoulder can occur from prolonged lack of use of the shoulder as a result of protracted pain and a worsening rheumatic condition. Rotator cuff disease – Rotator cuff diseases that cause shoulder pain include bursitis and tendinitis. In tendinitis, inflammation of the tendons lead to shoulder problems. More on bursitis below. Most shoulder problems result from the breakdown of the soft tissues around the shoulder region. Constant use of the shoulder can lead to rapid breakdown of the soft tissues as people age. Taxing manual work as well as taking part in sporting activities can also lead to shoulder complications. The pain can either be experienced in a single small spot, or occur in a larger area of the shoulder or even down the arm. Avascular necrosis: refers to a condition in which bone tissues die due to deprivation of blood supply. Avascular necrosis is also called osteonecrosis and can result in tiny bone breakages and eventual collapse of the bone. People who take high-steroid medications as well as those who excessively take alcohol are at a higher risk of contracting avascular necrosis. Although anybody can be diagnosed with this condition, it is common in people aged between 30 and 60 years. Branchial plexus injury: refers to the linkage of nerves which send signals from the spine to the shoulder, arm as well as hand. The branchial plexus can be injured when this network of nerves is compacted, strained, or in some serious cases, ripped from the spinal cord. Minor injuries to the branchial plexus are normally experienced by players of contact sports such as rugby and football, while motorcycle accidents are known to cause the most severe injuries to the branchial plexus. Broken arm: A broken arm can lead to shoulder pain due to the simple reason that an arm is connected to shoulder. A broken arm usually means that any of the three arm bones (humerus, ulna and radius) is broken and this is commonly caused by falling over an outstretched arm. Broken collarbone: The collarbone links the shoulder blade to the upper side of the breastbone. Kids and young adults usually suffer from broken collarbones due to injuries in sports, falls as well as trauma resulting from traffic accidents. Bursitis: is a condition affecting small fluid-filled sacs, known as bursae, which cushion bones, muscles as well as tendons around the joints. Bursitis results from inflammation of the bursae and the condition causes excruciating pain. Other causes of shoulder pain include frozen shoulder, dislocated shoulder, rotator cuff injury, osteoarthritis, septic arthritis, torn cartilage, hiatal hernia, tendinitis and separated shoulder. Western medical treatments for shoulder pain usually include the administration of anti-inflammatory medicines, particularly ibuprofen and naproxen. Acetaminophen and other pain relievers are at times recommended. Depending on the shoulder pain causative factors, medications such as antidepressants and muscle relaxers may also be administered. Shoulder arthritis conditions are usually managed using corticosteroid injections. Some shoulder problems, especially the ones involving the spinal cord and nerve roots call for surgical operations. Western medical treatments have in many instances failed to offer relief to patients suffering from chronic shoulder pain and this has led to the increasing popularity of alternative medication, acupuncture and Chinese traditional medication in particular, in the treatment of shoulder pain. The UK Acupuncture Organization has published a fact sheet showing the efficacy of acupuncture in treating shoulder muscle problems and sports related injuries. For many people, shoulder problems arise from physical exertions during work. Additionally, mental toils, particularly emotional stresses can also lead to shoulder pain. Luckily, doctors and physiotherapists have increasingly admitted the efficacy and safety in administering acupuncture and Chinese medication. Developed over more than two thousand years, Chinese medicine has perfected the art of eliminating physical and mental blockages and imbalances in the flow of life energy (known as Qi) around the body and thus get rid of bodily afflictions such as shoulder pain and neck pain. Consistent research results like the studies listed in the references section have demonstrated that acupuncture is highly effective in the treatment of shoulder pain, reducing inflammation, spasm and overall pain. 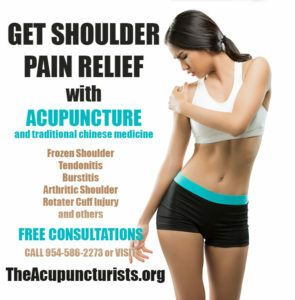 If you’re suffering with shoulder pain, let The Acupuncturists of Margate, Coral Springs and Coconut Creek help. We will find the root cause of your shoulder pain and help you experience lasting relief. Consultations are always free so give us a call today! Cummings, M. (2003). Acupuncture and the World Health Organization. Focus on Alt and Complementary Therapies, 8(3), 293-294. Dale, J. (1997). Acupuncture practice in the UK. Part 1: report of a survey. Complementary Therapies in Medicine, 5(4), 215-220. Green, S., Buchbinder, R., & Hetrick, S. E. (2005). Acupuncture for shoulder pain. The Cochrane Library. Richardson, P. M., & Vincent, C. (1986). Acupuncture for the treatment of pain: a review of evaluative research. Pain, 24(1), 15-40. Standish, L. J., Kozak, L., & Congdon, S. (2008). Acupuncture is underutilized in hospice and palliative medicine. American Journal of Hospice and Palliative Medicine, 25(4), 298-308.